We’ve all heard the media’s take on notorious criminals, but when have we had a chance to hear directly from the lawyers who defended or prosecuted them? We’ve all lamented the fate of a person who we think was wrongfully accused, but who better to explain what happened than his or her counsel who was there for the client every step of the way. 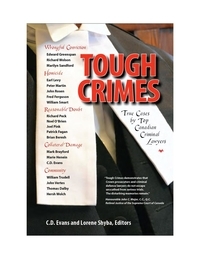 Included in the list of twenty-one eminent contributors are Edward Greenspan on a miscarriage of justice; Marie Henein on the wrongfully charged; William Trudell on the Walkerton water treatment tragedy; Mark Brayford on Robert Latimer; Richard Peck on the Air India disaster; William Smart on “Mr. Big”; Thomas Dalby on the Taber School shootings; John Rosen on defending Paul Bernardo; and Earl Levy on Toronto’s Shoeshine Boy Murder.